Ted has over 19 years of health care experience. Before becoming the senior director for benefits at U-M, Ted served as U-M’s director of benefits strategy. 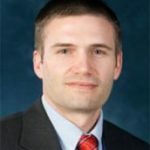 Prior to joining U-M, he was the director of clinical performance management at MCARE and the National Manager of Reimbursement for General Motors Company. In addition, Ted worked for Oakwood Healthcare and Care Choices HMO. Ted received his Bachelor of Science degree from Central Michigan University and his M.B.A. in Finance from Wayne State University. He is a member of the Healthcare Financial Management Association and the National Association for Healthcare Quality. Ted is a Certified Professional in Healthcare Quality and a Certified Group Benefits Associate through the International Foundation of Employee Benefit Plans and the Wharton School of The University of Pennsylvania. He also serves on the Board of Directors for The Leapfrog Group, an organization committed to hospital quality and safety.